For me, summertime fare means fresh, happenin' side dishes. Sure, barbecue chicken and burgers on the grill are fabulous. But, I really look forward to the sides when it comes to summer cookouts and gatherings. Potato salad. Crisp, sliced cucumbers paired with fresh dill and doused with vinegar. Buttery corn on the cob. Fresh fruit salad. A good guacamole. A crudité platter with creamy dip. And, pasta salad. Glorious, scrumptious pasta salad. 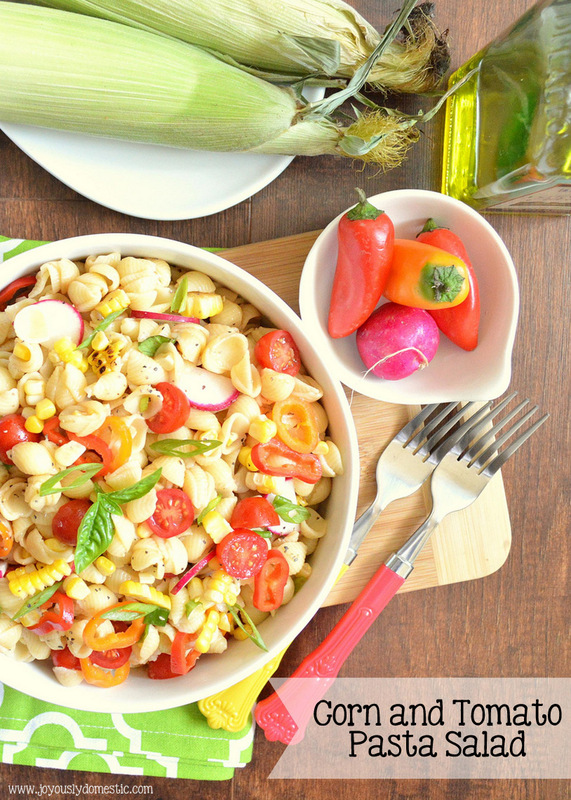 I make so many versions of pasta salad throughout the summer months. This one is a great recipe for showcasing fresh corn and garden tomatoes this time of year. What's great about this salad is that it gets better with time. So, it's the perfect make-ahead side dish for your summer gatherings and parties. Gather up some just-picked vegetables, grab a box of mini pasta shells, break out that bottle of balsamic vinegar and make this before the summer is over! Cook pasta in a large pot of boiling and heavily-salted water for 8 - 10 minutes. Drain the pasta and rinse under cold water. Transfer pasta to a large mixing bowl. Transfer corn to a cutting board. Once slightly cooled, cut kernels from cobs. Add kernels to the cooled pasta. Add in the scallions, peppers, radishes and tomatoes. Tear the basil into pieces and add into the pasta mixture. In a small mixing bowl, whisk together the oil, vinegar, lemon juice, 2 teaspoons salt, 1 teaspoon black pepper and red pepper flakes (if using). Pour over the pasta mixture. Mix to thoroughly bring together and coat the ingredients. NOTE: The dressing for this salad can be made into a creamy dressing by simply adding 1 cup of good-quality mayonnaise and 1/4 cup sour cream into the vinaigrette base. If adding in the mayo and sour cream, serve pasta salad cold.